Son Heung-min has won the Premier League's Goal of the Month award for November for his stunning solo effort against Chelsea. Collecting the ball just inside the Chelsea half, Son sprinted down the right wing, outpacing Jorginho before cutting into the box, beating David Luiz, and then calmly finishing past Kepa Arrizabalaga. It was ​Son's first Premier League goal of the season and it gave ​Tottenham a 3-0 lead in a match they went on to win 3-1, bringing an end to ​Chelsea's unbeaten start to the campaign. 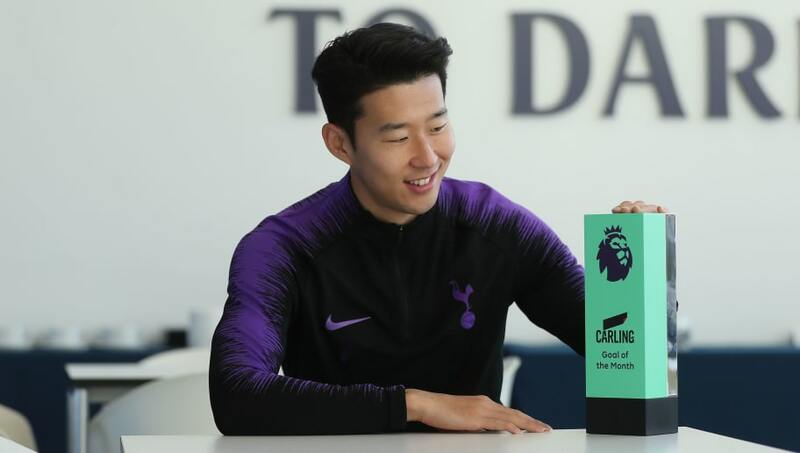 "One of the best goals in my career because it was a London derby, a big game," Son told the ​Premier League website after receiving his award from Carling. "I was so excited to play Chelsea and score such a beautiful goal." Son is the third Tottenham player to win the Goal of the Month award in 2018, following Victor Wanyama and ​Christian Eriksen in February and April respectively. He is also the first Asian player to win the award, which has been handed out every month since the start of the 2016/17 season. This is not the first time Son has been honoured by the Premier League, having previously been named Player of the Month in September 2016 and April 2017. Son has already made a strong case to retain the award with his brilliant strike in Tottenham's win over Leicester at the King Power Stadium last weekend.